Discussion in 'General Discussion' started by Konniver, Jun 20, 2016. The site now has the following tools available, but they are constantly being improved and more are in development. 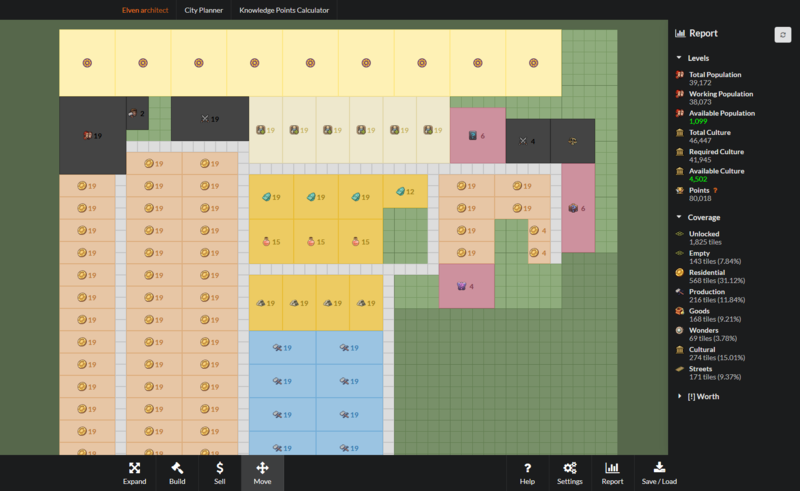 City planner - Build, test and optimise city layouts without the limitations of trying this in-game. Battle simulator - Battle armies against each other to determine who will come out victorious. Knowledge points calculator - Determine how much your next batch of knowledge points will cost you. Building comparison - Compare buildings that provide certain benefits, ranked in order of tile efficiency. Zemina, swiftvixen, Rigr and 13 others like this. awesome, untill now I was using anno designer. Has potential, but very buggy when it comes to placing selling and placing stuff again, it gets red en gets stuck. Also missing the option to choose colors myself for buildings. Hi CrazyWizard. Thanks for letting me know about that bug. It should no longer happen. ok made the same city twice. I love the report/calculator. It's incedibly hady when building. Yet I really Really really miss an option to create my own color scheme. the reason is simple: check the same city twice. One made in ElvenArchitect and one in Anno designer. In ElvenAchitect City Planner tool there are a lof of "confusing" area's the best example is where I have drawn an arrow under the workshop, where it's not very easy to spot what tile is a road and what tile is a culture object. I like to create my won color scheme so that for me it's easy and clear to see where to fit what. For the rest an awesome tool, keep up the good work. It is really easy to use. You place mouse on the object and you will see what exactly it is. There's definitely a stark difference between the two builders. Perhaps I've been looking at mine so much that I didn't anticipate the pastel scheme being an issue, although I was toying with the idea of a colour-blind or high-contrast mode further down the line. I'll add custom user colour schemes to the suggestion list. However there are other core features that I'd like to get working first, so if it were to be implemented, it wouldn't be too soon. If others are having problems with the default colour scheme too, then I'll definitely consider changing that much sooner. It looks an awesome tool with loads of potential, but when i try to build a lvl 19 house in a elven city, the house appears in the wrong direction. i am missing something? I am assuming the grid we see is the same as the one in game, so the house should be 2x4 and not 4x2? Same prob with the other buildings, does this means the grid we are showed is rotated sideways? is there a way to change that? Edit2: I am still trying to understand the orientation... would the cliffs with the Wonders be considered the top of the map? I am assuming the grid we see is the same as the one in game, so the house should be 2x4 and not 4x2? Same prob with the other buildings, does this means the grid we are showed is rotated sideways? The grid is not rotated sideways and is the same as is used in game. All building dimensions take the form of width x height, and as you have already mentioned, a level 19 elven residence is 2x4 (2 tiles wide, 4 tiles high). It sounds like that your version of North is different from the game's version of North, which isn't neccessarily wrong but can cause confusion. It doesn't help that InnoGames' other games use different orientations (i.e. Forge of Empires). Even the Elvenar wiki interchange orientations as any buildings page list dimensions as width x height, but the Basics page lists your starting area as 15 x 10 (height x width). Changing rotation sounds like a good idea, will look into it. If you are using Windows, search for Snipping Tool in your start menu. It's a life saver! Thanks for all the answers konniver! talking with ppl in my Fs lead me to think that for other players the top is the cliff with the wonders, whilst for me, i view it as the left with the trees and the river on the background. This changes the way one views the orientation. that's what got me confused! I've just made an update to the Elven Architect. The ancient wonders Endless Excavation and Needles of the Tempest have been added to the build menu. Some buildings have had their colours adjusted to increase the contrast between them, which include streets, armories and cultural buildings. An alternative save method has been added, allowing you to now store your city in your browser. madzix, Prendyo and Da Twista like this. Already awesomely simple tool. With whole city rotation would be even more awesome. Thank you so much for creating this city planner!